You can replace the grills on your OSD Audio ceiling and wall speakers if they become damaged. Please note, however,these grilles ONLY work with OSD Audio speakers and not other brands. Please indicate which speakers you are buying the grills for. This is just for one pc grill price. We sell replacement grills for ceiling speakers and in-wall speakers. Please specific your speaker size. can you match a Niles CM 650 BG spealer grill? 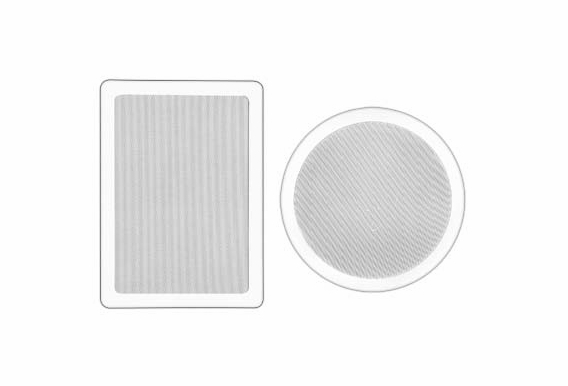 I am looking for an outdoor white replacement speaker round grill that is 8.875" in diameter. Do not know the speaker manufacturer. Do you have any the fit this description? Niles audio system a 10" speaker cover is needed round and in white. We need wall speaker grill replacements. The over all measurement is 6.25 x 9.75. Do you carry this size? What size do you have in both round and rectangle? Do you carry a round speaker grill measuring 7.5" in diameter?? I need a complete wall cover for a Parasound PAL 1002 Woofer. 10 inch speaker, square cover. I need a white 6.25 inch round metal speaker cover. Is this something you sell? I have 14 in ceiling speakers ( installed 20 years ago!) with "yellowed" instead of white trim. The trim measures 12" x 81/2" Please advise on how to get replacement speaker covers. My grills are 10" diameter off white with a 1 1/4" rim. Do you have this size? I bought ICE600WRS speakers and don't know how to get the grill off without damaging it. Can you help? I am looking for an in ceiling speaker grill that measures 7 1/4". It is the type you just push in place. How are the speaker grilles removed from the speaker? 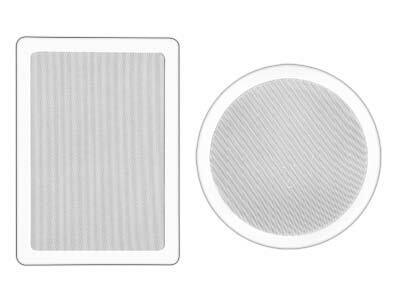 Need a grille cover for a pioneer in wall speaker S -IW871-LR. Do you have the speaker grills for these speakers, it's about 6 x 9". thank you. I currently have to speakers set in the wall with the rectangular covers. The Bose speakers measure 6.25" x 3.25". The current covers are 8 x 11. Will these work? I have sold my home and want to take the ceiling speakers with me however i need to put something in the holes the speakers were mounted in. I am hoping I can purchase a grill of some sort that will fill the hole so that it is cosmetically pleasing to the eye. Can you tell me if you carry something like this I need it by the end of the month of October. thanks. Hi, can you send me some pictures of the grill? I wanted to know how to mount it to the ceiling. Appreciate if you can send me some pictures from various angles - top, side, back, etc.